Director Franco Rosso’s “Babylon” was never released in America. 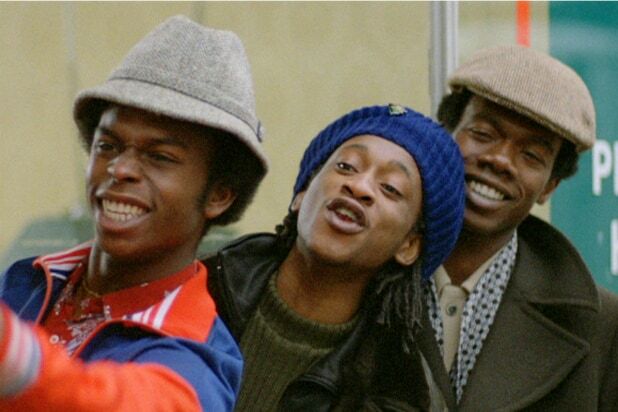 It’s a 1980 film with subtitles and no big-name stars that centers on poor black male youths in London living among neighbors who shout, “Go back to your country!” from their bedroom windows on a regular basis. It’s about their daily resistance to hate and navigating a system that is rigged against them. The characters speak in Jamaican patois, and there is no white savior. In many ways, it is the antithesis of what mainstream audiences in America were interested in watching at that time (which isn’t much different from today, actually). But 39 years later, it finally sees the light of day in U.S. theaters. Through a story that primarily follows Blue (Brinsley Forde), a mostly out-of-work reggae DJ just trying to get by and to find his own sliver of happiness, “Babylon” explores what it’s like to be forced constantly to confront racism in the workplace and on the streets. In doing so, it shines a light on his friends, including Beefy (Trevor Laird), a hustler struggling to control his temper in a society that instantly vilifies him, and Dreadhead (Archie Pool), the leader of Blue’s music crew who must bargain and sacrifice just for them to have some space in the game. There is even a masterful scene when Blue, just looking for some company one night, witnesses his friends lure and mug a random white man on the street; they saunter away counting their new wad of cash. “They do it to us, we do it to them” is pretty much the justification. It’s a dog-eat-dog world in which Blue and his crew don’t even factor. Black male malevolence and disenchantment are one and the same in this unforgiving landscape that comes in sharp focus through Chris Menges’ rough cinematography. But despite how resonant the themes of “Babylon” are, black women are further disenfranchised from the conversation. Blue’s sort-of girlfriend Elaine (Beverly Michaels) almost becomes a victim of his rage when he tries to come back into her life after going off on his own. He gets upset when she’s not home when he wants to see her and raises his fist to her, stopping just before he makes impact with her face and retreating in despair. Blue’s mother is seen only in a side view yelling at his dad about something (or everything in general, it’s hard to tell) as Blue storms out of the house. And his friend Lover’s (Victor Romero Evans) fiancée has exactly zero lines, even at their engagement party. It’s as if to say these women’s voices and experiences have no importance in the overarching themes of the story, which is of course problematic. Not to mention disingenuous. It’s an issue that continues to be reflected in our society through the various ways that we talk about social justice and marginalization, usually through the perspectives of men. “Babylon” is no different. It aims to shine an empathetic light on black victims of bigotry while simultaneously silencing women. That’s not to belittle the impact “Babylon” has, but it should be noted — particularly amid today’s women’s movements — and taken into careful consideration as we move forward, together, in the fight. Woman or man, it’s hard not to feel sympathetic toward the daily struggle not to react to disenfranchisement violently as felt in the film’s penultimate scene. Blue, generally a pacifist who often has to hold Beefy back from strangling a racist white person, finds himself angry and without his crew, knife in hand, when he knocks on the door of one their hateful neighbors after finding their sound system in shambles. It’s followed by a scene where Blue and his friends are back together in a club, dancing and singing along to the music, emanating the vibe that they refuse to be held down. It is a roaring, almost hypnotic final few moments that stay with you long after the closing credits. While “Babylon” is on most accounts revolutionary — as it shares the experiences of men who must defend their very humanity, right to make a living and to play their songs (“jungle music,” as it’s often referred to in the film) — the movie’s re-release brings up an interesting question about how we reckon with so-called classics that disrupt the system while also sidelining female voices. The lead performances are so genuine and the dialogue, with tones ranging from unbridled glee to utter hatred, is so pure that you think at times that you’re watching a documentary. “Babylon” is a vivid, though flawed, story that offers no clear villains or angels. Instead, it gives you the truth. “The Eighties” reigns supreme among all of CNN’s decade-centric specials (sorry, “Nineties”). Those who were alive in the 1980s will remember leg warmers, inline skates and so much more. Thanks to the magic of TV, even ‘90s and 2000s kids can experience these things. Whether you fondly look back on the decade, or you wish you had been born 10 or 20 years earlier, these 10 TV shows will surely fuel your ‘80s obsession. The characters may be fictional, but "GLOW" is very much real. This Netflix comedy tells the (lightly fictionalized) story of the women who starred in the cult-hit all-female pro wrestling TV show GLOW (“Gorgeous Ladies of Wrestling”) that aired for four seasons in the 80s. Before “Bloodline,” Linda Cardellini starred in “Freaks and Geeks” alongside James Franco, Jason Segal and Seth Rogen. Cardellini’s character, Lindsay Weir, tries to shed her goody-two-shoes image and hang with the rebellious “freaks,” often running into trouble. Set in 1980s Indiana, science fiction/horror-thriller “Stranger Things” plays on many cultural elements of the decade, such as Stephen King novels and Spielberg films like "E.T." This autobiographical sitcom is based on comedian Chris Rock’s 1980s adolescence in Brooklyn. A young Chris (played by Tyler James Williams) must navigate a predominately white school, look after his siblings, and try to keep his tough parents happy. Another show based on its creator’s childhood, “The Goldbergs,” is set in a small Pennsylvania town in the 1980s. The show leans hard on the decade's most awkward elements, like tracksuits and hideous matching outfits. This Cold War-set drama stars Keri Russell and Matthew Rhys as Soviet spies posing as a normal American couple in the D.C.-area. It was created and produced by former CIA officer Joe Weisberg and inspired by some of his real-life experiences. This crime drama from John Singleton explores the origins of the Los Angeles 1980s crack epidemic. It premiered July 5 on FX. “This Is Us” takes place only partially in the ‘80s, but it still counts. The non-linear time sequence touches on the past and present of the lives of three siblings (two biological and one adopted). The second season of the series will air on NBC on September 26. The Cartoon Network show follows a teenage robot named Jones who has to navigate human life in a futuristic 1980s middle school. The show’s blocky artwork is a nod to old school cel animation techniques. This cult hit AMC series tracks the personal computer revolution of the ‘80s. The personal computers in question, however, are a lot clunkier than the dainty, portable ones we use today.